Test Driving a Vehicle: Who is At-fault in an Accident? Test Drive Accidents: Who’s Liable? Test drive accidents are rare, but they are a possibility. 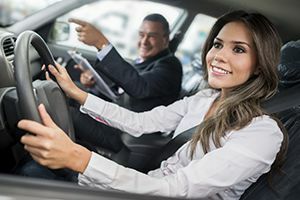 If an accident occurs while you are test driving a new vehicle, or while a potential buyer is test driving an automobile which you are selling privately, you may wonder how to handle the situation. Who is responsible in this scenario? Fortunately, a test drive accident is typically covered by insurance, like any other automobile accident. The majority of car dealerships have insurance policies to cover the vehicles they are selling. This insurance covers the vehicles while they are on the lot, or off the lot, such as during a test drive. Even if you were at fault for the test drive accident, a dealership may elect to use their insurance to cover the price of repairing the damage. If you were at fault for the accident, the dealership may attempt to hold you liable for the damage. Should this happen, you can work to prove that you were not at fault for the accident. Or, you can use your own auto insurance policy to pay for the damage, which is how rental car accidents are handled. If it was your personal vehicle that was involved in a test drive accident, or the dealership is refusing to pay for damages, you may treat this situation as you would any other accident. You may submit a claim to your insurance provider, and pursue a claim to recover costs from the at-fault driver. Gather information from the driver(s) involved, contact information from any witnesses, and take photographs of the accident scene and damage. If you have been involved in a test drive accident, contact The Edwards Law Firm for assistance with your claim. We can help you get the compensation you deserve.